Hi my name is Ariel! 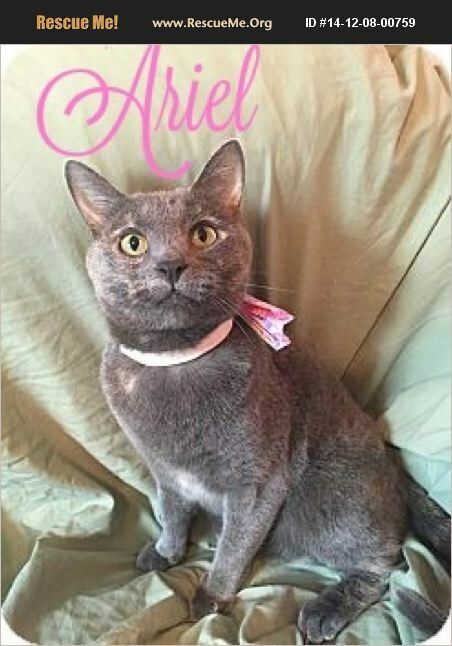 I am a sweet Blue/ Cream Torti, Russian Blue mix or in simpler terms, I am beauty inside and out. I am 2 years old and have been in foster care most of that time. I have had some interest in the past, but no one wanted to follow through with meeting and adopting me. When I was 6 weeks old, I was rescued from a backyard with my two sisters, Hadlee and Rayne. Overall, I am very sweet and gentle. I am a talker but I am not that loud aka a 'quite roar'. I love treats, being pet, playing and looking out the window. I am not a lap kitty but I will sit on the couch right next to you and watch whatever you watch. I have a big motor and am easily made happy. If you say may name I will come running over for love. I am current on all my vaccinations, micro chipped, combo tested (neg/neg), potty trained, I would prefer to live as a single kitty. I have all the traits of an amazing forever friend and would love a home of my own. If you are interested in adopting me, please fill out an application! I would love to meet you. ****Adoption fee is Tax Deductible and includes spay/Neutered, microchipped, combo tested, vaccinations, dewormed and flea control. ****Adoption fee goes towards food, bedding, medical expenses, shelter fees to rescue dogs and cats from high kill shelters before they are put to sleep, ect.